Fort Ross-Seaview consists of 27,500 acres contained entirely within the large Sonoma Coast AVA and does not overlap any other viticultural area. The formal petition calling for AVA approval was presented in 2003 by Patrick Shabram, a consulting geographer and Linda Schwartz of Fort Ross Vineyard & Winery and David Hirsch of Hirsch Vineyards, but not approved until January 2012. This was due to various opinions on boundaries, whether to include Annapolis to the North, and what the new AVA would be called. Hirsch notes that 18 different growers were involved in penning the petition. The distinguishing feature of the Fort Ross-Seaview AVA is that most vineyards are located along the Pacific coastline on ridge tops that form islands in the sky at elevations between 920 and 1,800 feet above sea level. This puts them above the natural fog line, but close to the Pacific Ocean, creating a moderate climate of “cool sunshine.” Unlike most of California where vineyards are planted on valley floors and some hillsides in alluvial soils, vineyards in the Fort Ross-Seaview AVA are on hilltops flanked by gullies and narrow valleys and amongst dense redwood forests. The San Andreas Fault runs right through the region and created the convoluted topography. There are many soil types, but sedimentary rock, sandstone and shale prevail. 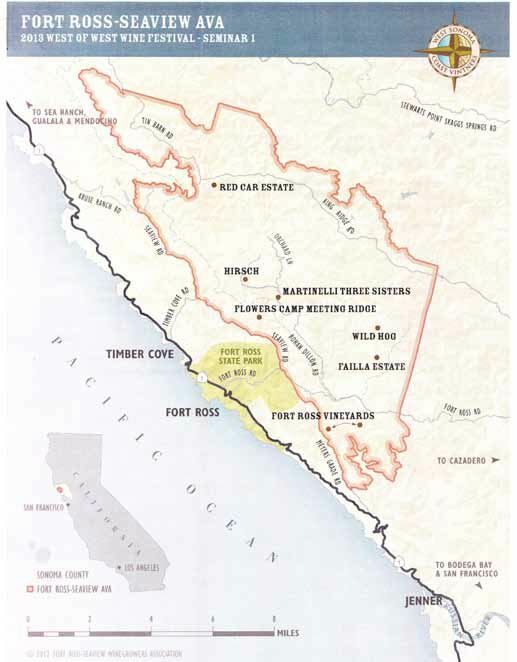 David Hirsch pointed out that the Fort Ross-Seaview area, at least where he is located, is a confluence of four ecosystems, making the region particularly unique: the ocean, the rivers, the redwood forest and the ridge tops. The nearby Pacific Ocean helps to keep the vineyard temperatures from rising or falling to extremes. The rivers in the gullies play a complimentary role, helping to cool the ridge tops in the heat as well as drawing cool air downward in the cold to negate the threat of frost. The redwood forests are essentially a rainforest, while the ridge tops have a continental climate. When weather systems arrive from the Southeast, vineyards above 900 feet elevation have longer periods of sunlight and more warmth than the land below with the temperature reaching into the 90s, and even into triple digits on occasion. Pinot Noir and Chardonnay are the most common varieties grown in the Fort Ross-Seaview AVA with small amounts of Zinfandel, Petite Sirah, Syrah, Pinotage, Viognier, Marsanne and Roussane. There are 18 commercial vineyards on 506 acres. Wineries located within the Fort Ross-Seaview AVA: Flowers Vineyards & Winery, Hirsch Vineyards, Peay Vineyards, and Wild Hog Vineyard. Wineries that are located outside the Fort Ross-Seaview AVA but purchase grapes there: Benovia, Bjornstad Cellars, B. Kosuge Wines, Davies, Del Dotto, Drew, Dutton-Goldfield, Freeman Vineyard & Winery, Kutch Wines, LIOCO, Littorai, Morlet Family Vineyards, Siduri, Williams Selyem, WesMar Winery, and W.H. Smith Wines.